In October 2017, the second international workshop for drinking water UV-AOP (Ultraviolet – Advanced Oxidation Process) treatment was held in Jinan, China. Representatives from municipal drinking water plants, government agencies, academia from universities in the province of Shandong, and water treatment technology companies were in attendance to hear representatives from TrojanUV present on the application, science, and implementation of UV-AOP. 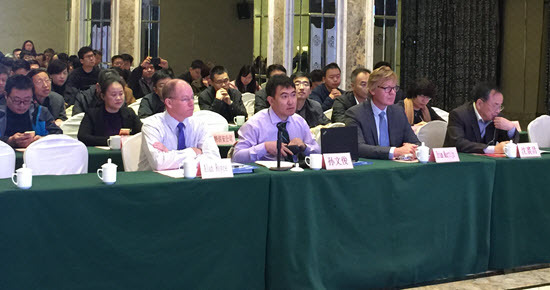 Trojan Scientist Alan Royce (leftmost on panel) in at International Workshop for Drinking Water UV-AOP in Jinan, China. The conference sparked many discussions and questions about the advantages and benefits of Environmental Contaminant Treatment (ECT), and why it is so important to drinking water treatment. ECT is a term used to describe an advanced water treatment process that focuses on targeting the removal of chemical compounds which can pose significant health risks or diminish aesthetic water quality and therefore compromise the overall integrity of a water source. Why is ECT so important in drinking water treatment? What experience does Trojan have? The treatment of drinking water is regulated globally and drinking water treatment is heavily monitored to ensure biological contaminants including bacteria, protozoa and viruses do not pose risks to public health. The removal of chemical contaminants generally requires treatment methods that are more advanced than those established for biological contaminant treatment. However, increasing global population is driving demand for quality drinking water. With population growth, more and more, cities are forced to rely on water sources that are exposed to chemical contamination. Trojan has helped dozens of municipalities destroy chemical compounds or contaminants in their drinking water to provide water that is safe and aesthetically-pleasing. UV-AOP (Ultraviolet – Advanced Oxidation Process) is the treatment process offered by TrojanUV for ECT. TrojanUV was one of the first to commercialize this process for the treatment of chemical contaminants in water. The process is driven by UV-light which is capable of weakening or breaking the chemical bonds of contaminants, therefore directly destroying many trace chemical contaminants found in water. This process is referred to as photolysis (photo = light; lysis = disintegration). In addition, UV-light can produce powerful oxidizing agents called hydroxyl radicals when hydrogen peroxide is added to water upstream of a UV system (through photolysis of hydrogen peroxide). These radicals are highly unstable and react with chemical contaminants immediately after they are formed. What interest is there with UV-AOP for drinking water treatment in China? How does it work? China extracts a significant amount of its drinking water from surface waters that are prone to algae blooms. When algae die, they are known to release the chemicals 2-methylisoborneol (MIB) and geosmin which can be difficult to treat by traditional drinking water treatment processes. This results in the earthy and musty tastes and odors in the finished drinking water. Regions of China, specifically the province of Shandong, have serious taste and odor events in their drinking water and the government is funding AOP technology to improve their drinking water quality. What solutions does Trojan offer for UV-AOP technology? TrojanUV is the leading supplier of ECT systems for taste and odor removal. Our UV systems utilizing hydrogen peroxide as an oxidant (with the hydrogen peroxide and delivery system sometimes supplied by our own USP Technologies) are capable of removing compounds attributed to the unpleasant taste and odor in drinking waters. Our vast knowledge of ECT is backed by our scientists who possess the fundamental understanding of the science behind contaminant treatment and are increasing their knowledge through further research in this area.